In present day Florida, in a trailer park called “Armadillo Acres”, Betty, Lin and Pickles sun themselves with complete indifference to ozone depletion. Ever hospitable, they set aside their sun reflectors to welcome the audience. “The Girls” also introduce Jeannie, agoraphobic and unable to step outside her trailer, much to the exasperation of her toll collector husband, Norbert. Just another day, nothing new, except for Pippi, a stripper-on-the-lam who arrives to stir up trouble on her five-inch heels! A sparkling irreverence makes this a laugh-out-loud musical with a country-rock and blues score. Bernard is planning a romantic weekend with his chic Parisian mistress in his charming converted French farmhouse while his wife Jacqueline is away. He has arranged for a Cordon Bleu cook to prepare gourmet delights and has invited his best friend Robert along to provide the alibi. It’s foolproof; what could possibly go wrong? Well, suppose Robert and Jacqueline are secret lovers and consequently determined that Jacqueline will NOT leave for the weekend. Suppose the cook has to pretend to be the mistress and the mistress is unable to cook. Suppose everyone’s alibi gets confused with everyone else's. An evening of hilarious confusion ensues as Bernard and Robert improvise at breakneck speed. 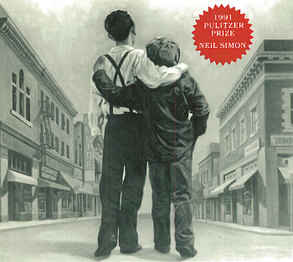 By America’s great comic playwright, this memory play is set in Yonkers in 1942. Bella is 35 years old, mentally challenged and living at home with her mother, stern Grandma Kurnitz. As the play opens, ne’r do-well son Eddie deposits his two young sons on the old lady’s doorstep. He is financially strapped and taking to the road as a salesman. The boys are left to contend with Grandma, with Bella and her secret romance, and with Louie, her brother, a small-time hoodlum in a strange new world called Yonkers.